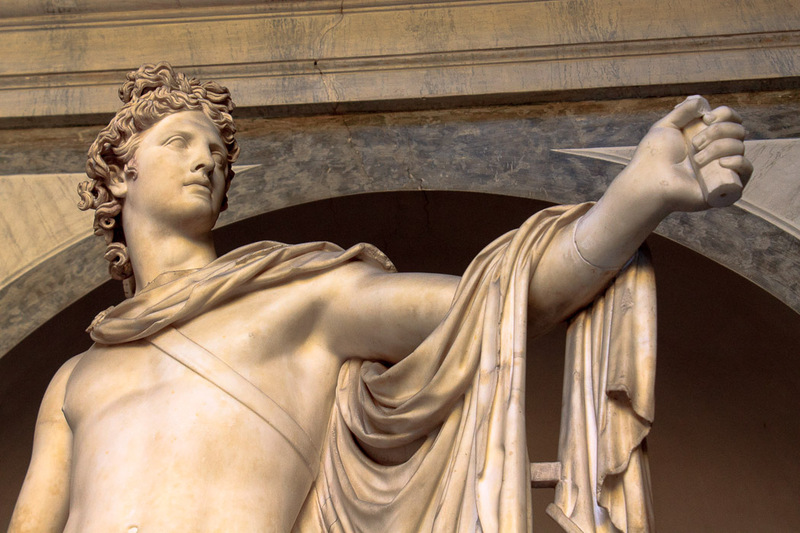 The Vatican Museum is a very large museum where you can spend anywhere from a couple hours to several days. It can be overwhelming and can get very crowded. To avoid lines, you should buy your ticket online in advance, and check the hours and days the museum is closed against when you plan to go. You must reserve the date and time you want to go, and you must print the voucher they email you. Then, at the museum, you can bypass the ticket-purchase line and go directly to the "Entrance with Reservations"line on the right. Once inside, you exchange your voucher for a ticket, showing your ID. 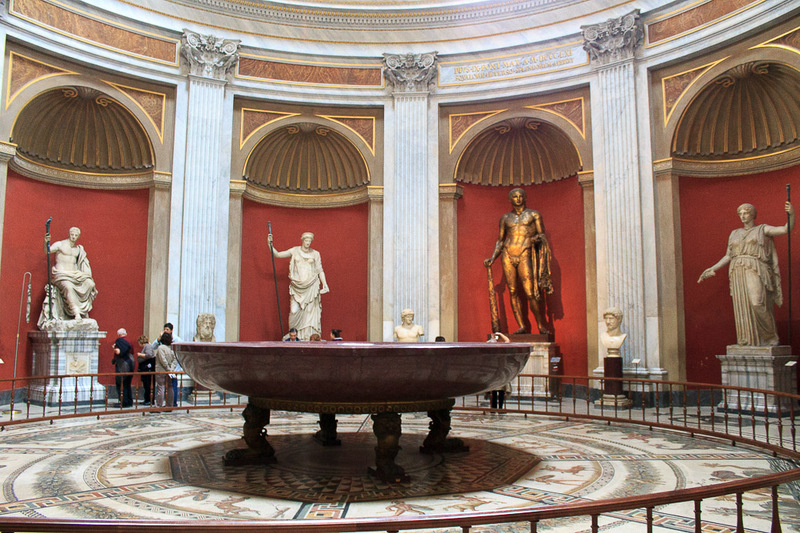 Although mornings are among the most crowded times to visit the museum, I recommend you go then, spend the morning and lunchtime in the museum, then see the Sistine Chapel, St. Peter's Basilica, the Dome Walk and St. Peter's Square in the afternoon and evening. I suggest this route because it reduces your walking distance. 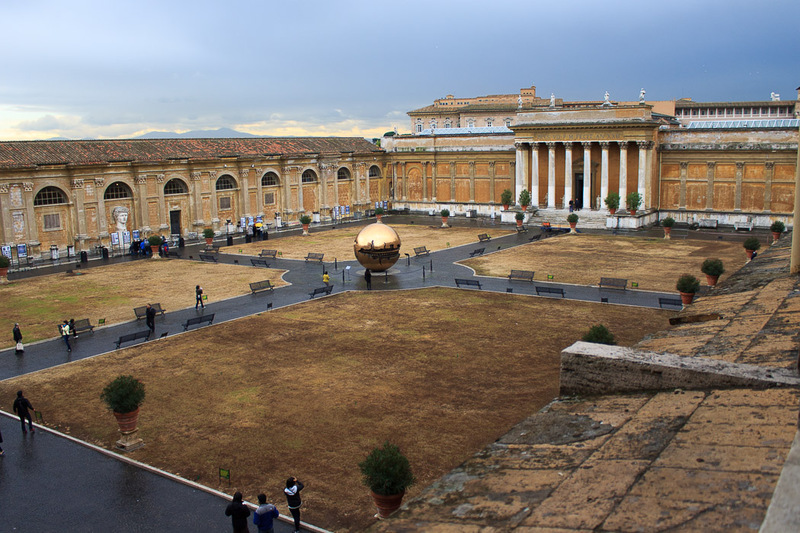 If you begin with the Basilica area, you'll need to walk around the outside of the Vatican to get to the entrance of the museum (about a 30 minute walk of about a mile), and when you finish the museum, you'll be back at the Basilica entrance anyhow. 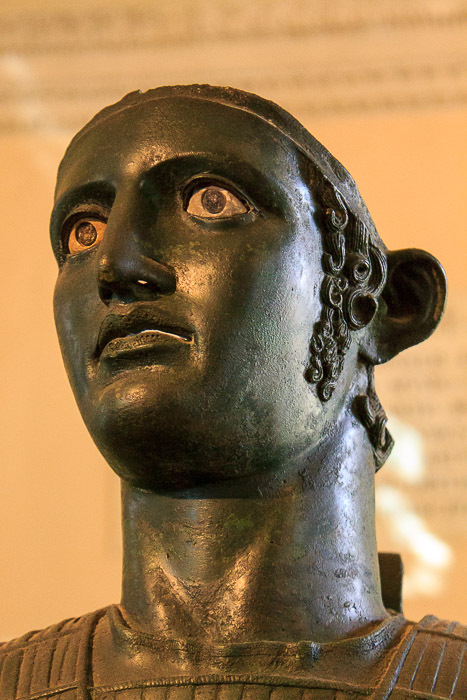 But that extra walk is the only reason I make this suggestion, you might avoid crowds better by seeing the museum during the afternoon when the crowds there are thinned a bit. 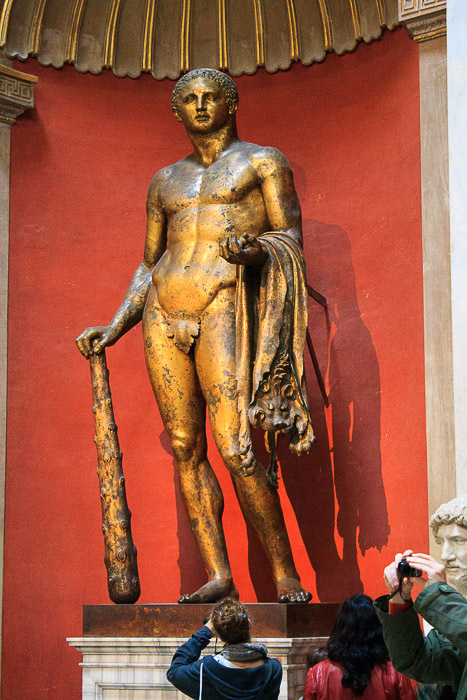 In any case, to get into St. Peter's Basilica or to take the Dome Walk or to visit the Museum, you must dress such that your shoulders and knees are covered, and shorts are prohibited. 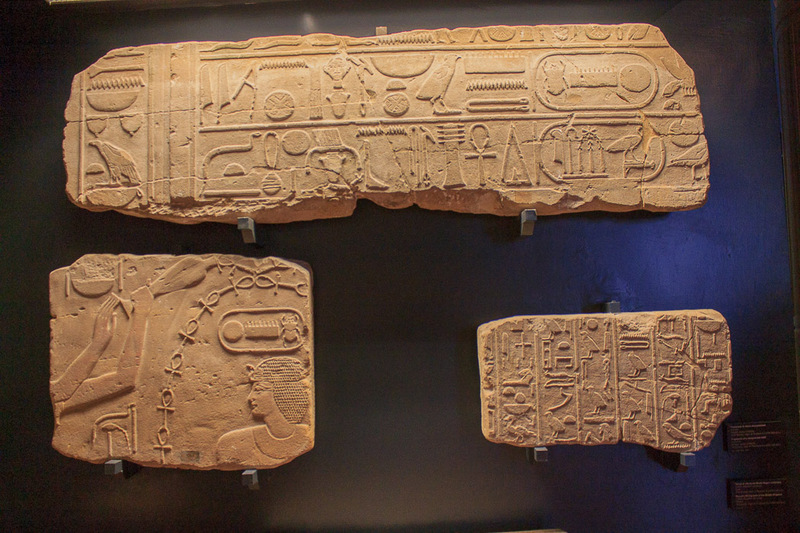 The museum has two exits and you should decide which route you'll take before you enter. 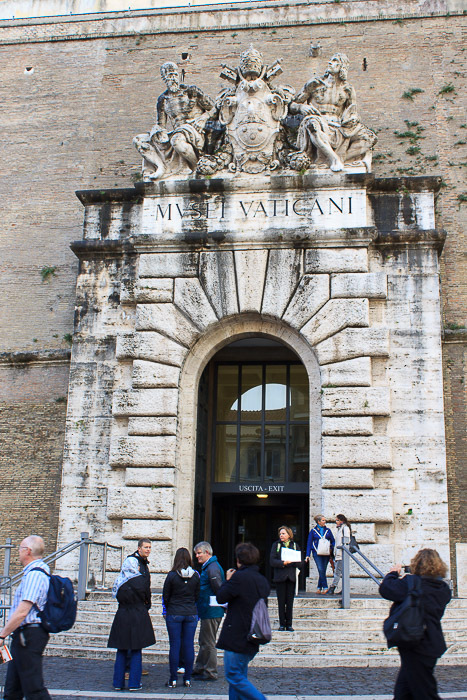 The main exit is near the entrance, at the north edge of the Vatican. If you rent an audio guide, you will must use this exit since you must return your audio guide, but then you're that mile away from the Basilica. 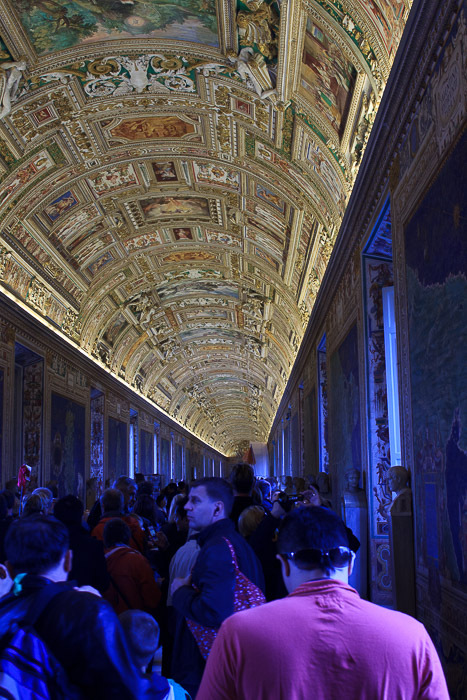 If instead you forego the audio guide, and don't have a bag large enough to have to check, you can exit from the Sistine Chapel at the end of the museum directly into the Basilica. This is the route I recommend, to save time and walking distance. However, I've read that sometimes that exit is closed since its officially only for tour-guides and their groups. 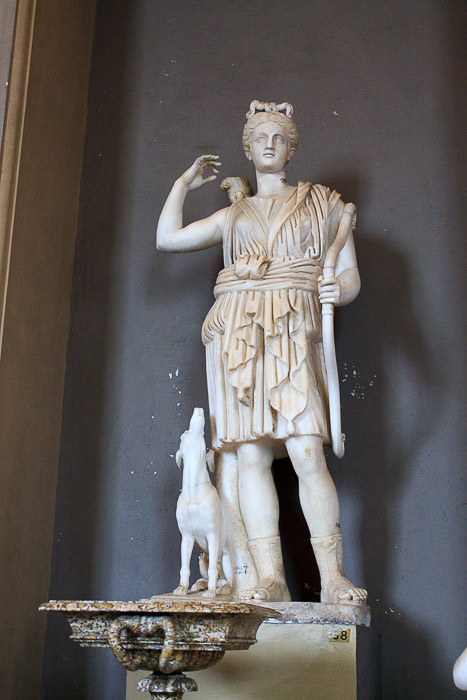 If it looks like people are being turned away, just blend in with a tour-group. 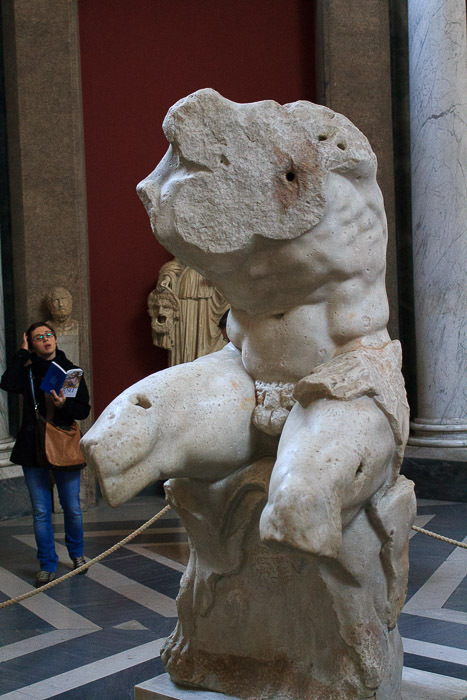 See all Vatican Museum photos. 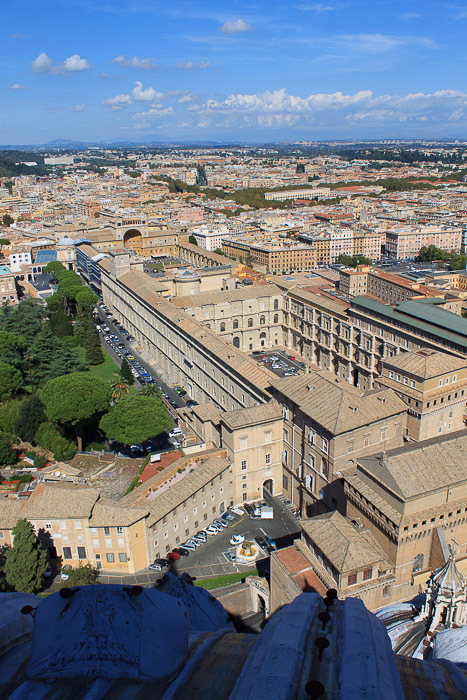 The Vatican Museum, from the top of the dome of St. Peter's Basilica. It is quite a large place. 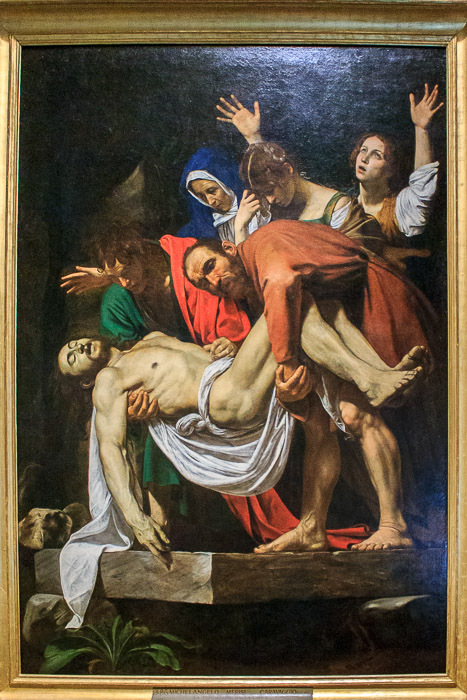 The Pinacoteca is the painting gallery in the Vatican Museum. 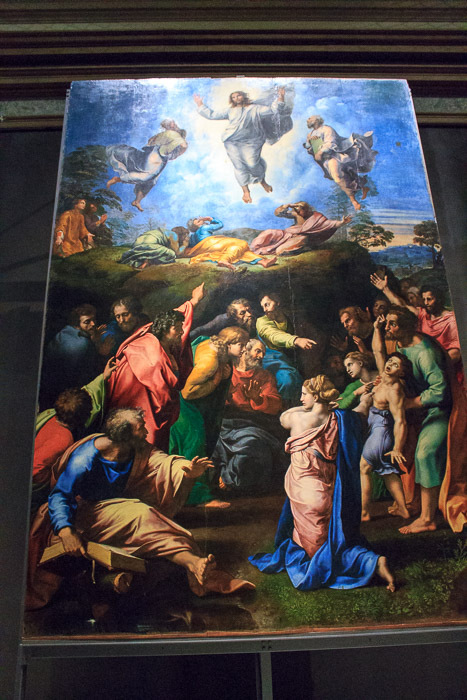 If you wish to see it and you're planning to exit the museum from the Sistine Chapel, you should see the Pinacoteca at the start of your tour. 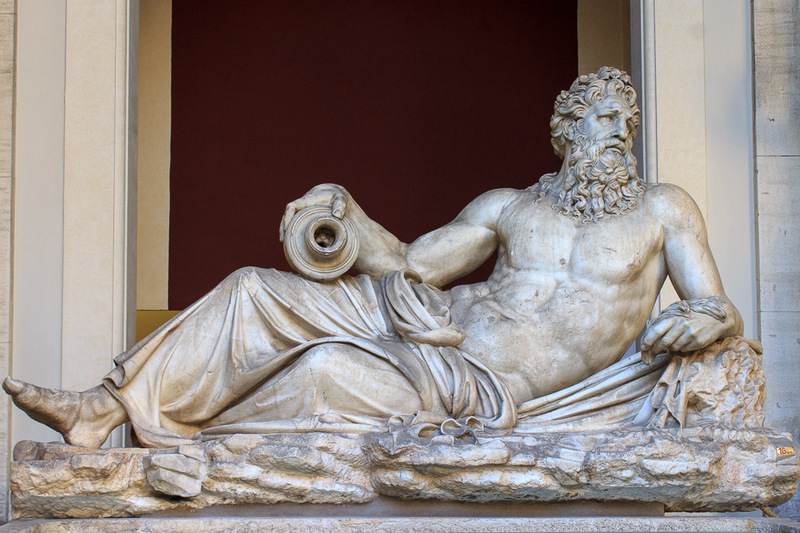 After the Pinacoteca, you'll be back on track for the normal direct route through the museum. 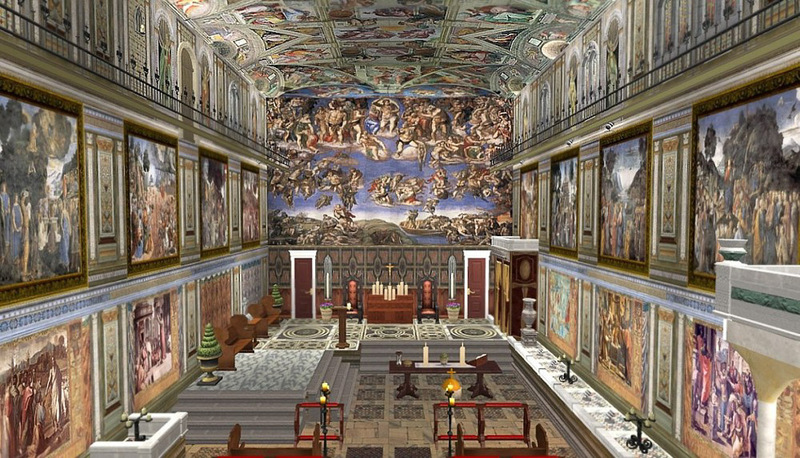 You'll begin with an Ancient section (my favorite) with Egyptian, Greek, Roman, and Etruscan areas, followed by a very long hallway with statues (I like this part, too), tapestries, then maps, followed by a set of many rooms from the Renaissance period, and finally to the SistineChapel. Now that you understand the task that awaits you, pace yourself and skip the sections you're not interested in so you can make it through in the time you want, and with the remaining energy that you want. 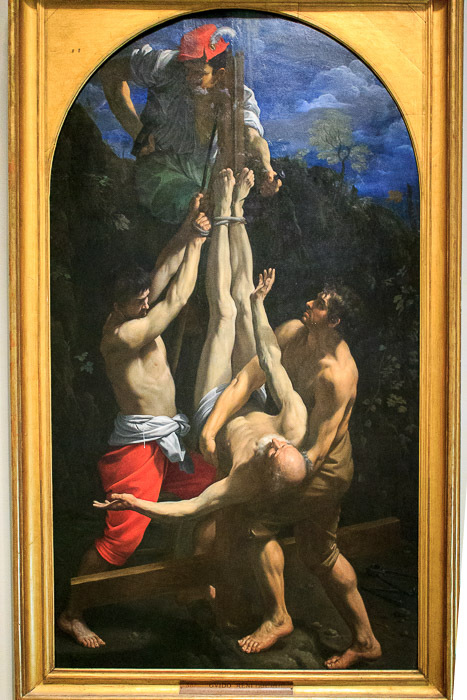 If you want to see the Pinacoteca (I breezed through it in about 20 minutes), the photos below are what I'd consider the highlights. 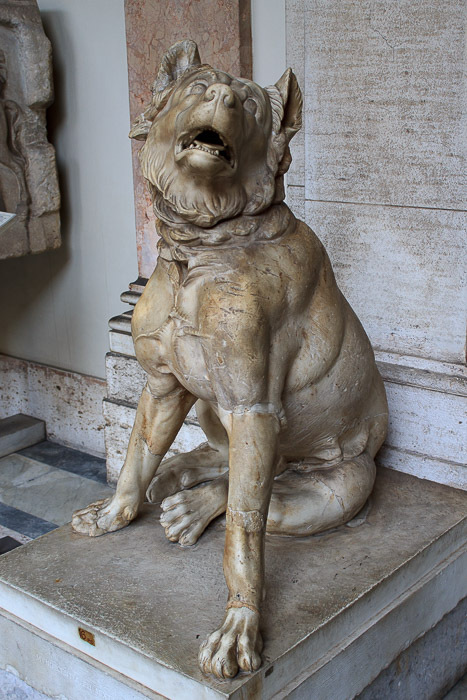 da Vinci's 'St Jerome in the Wilderness', circa 1482, in Room IX of the Pinacoteca of the Vatican Museum. Still in the sketch state it is one of the most enigmatic works of the great Tuscan painter, sculptor, architect, engineer and philosopher. The painting depicts Saint Jerome during his retreat to the Syrian desert, where he lived the life of a hermit. 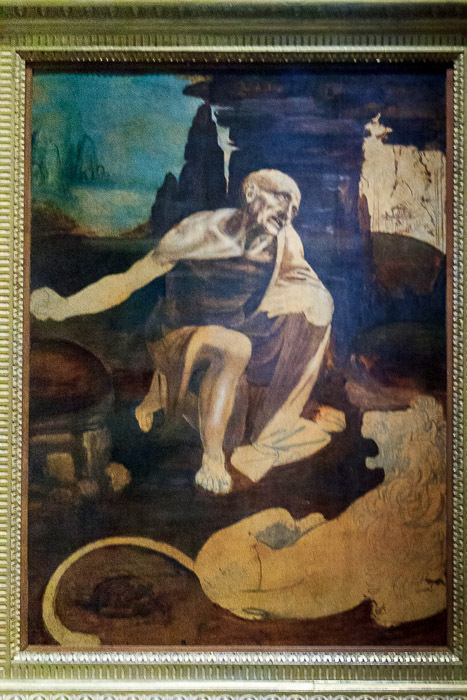 St Jerome kneels in a rocky landscape, gazing toward a crucifix which can be discerned faintly sketched in at the extreme right of the painting. 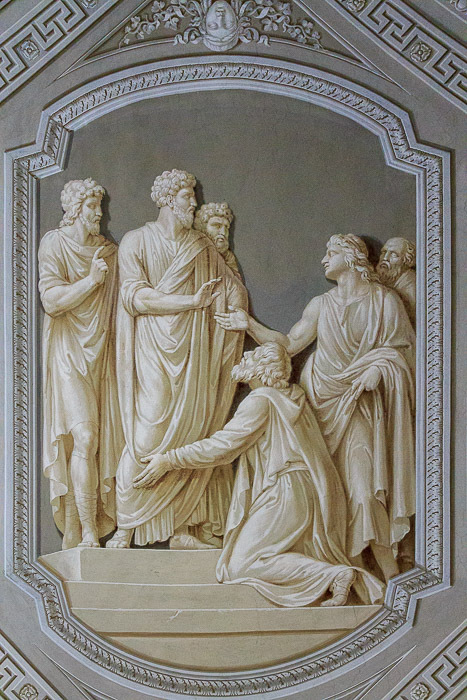 In Jerome's right hand he holds a rock with which he is traditionally shown beating his chest in penance. 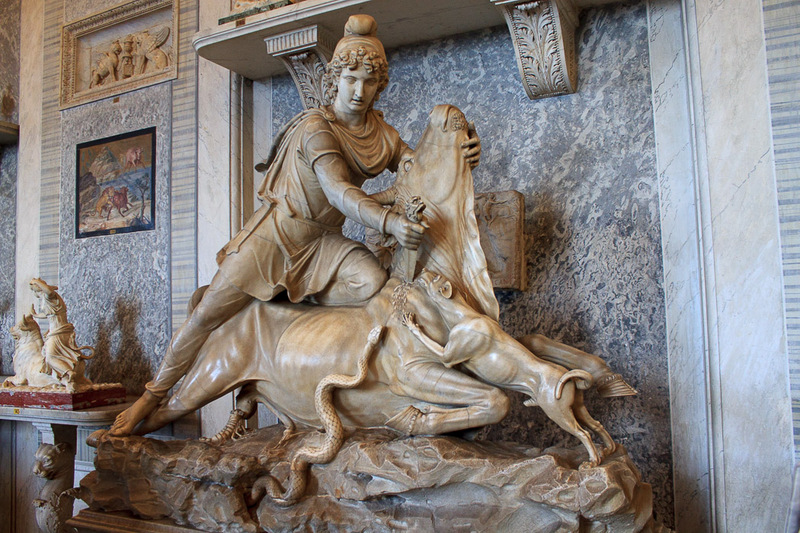 At his feet is the lion which became a loyal companion after he extracted a thorn from its paw. 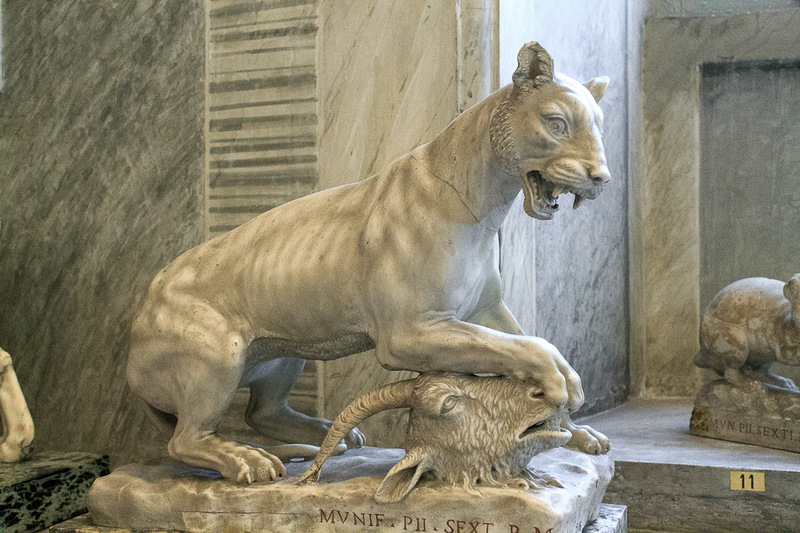 The lion, the stone and a cardinal's hat are the traditional attributes of the saint. 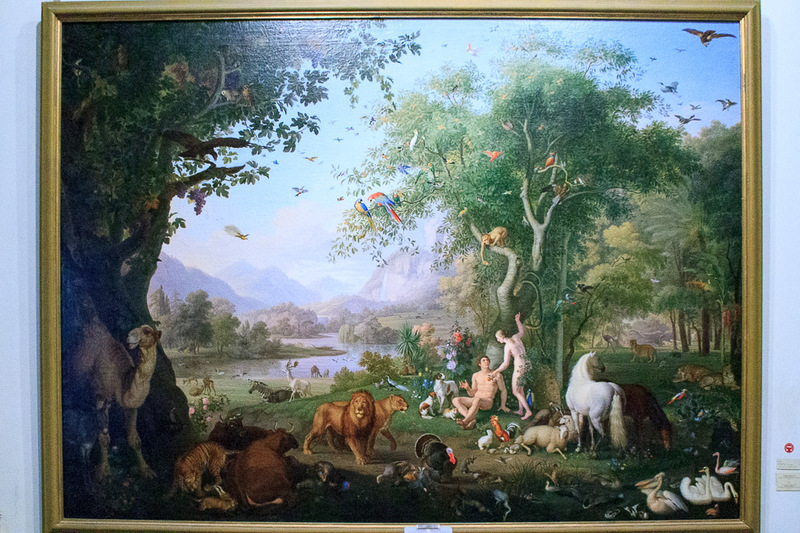 On the left-hand side of the panel the background is a distant landscape of a lake surrounded by precipitous mountains shrouded in mist. To the right-hand side, the only discernible feature is a faintly-sketched church, seen through the opening in the rocks. 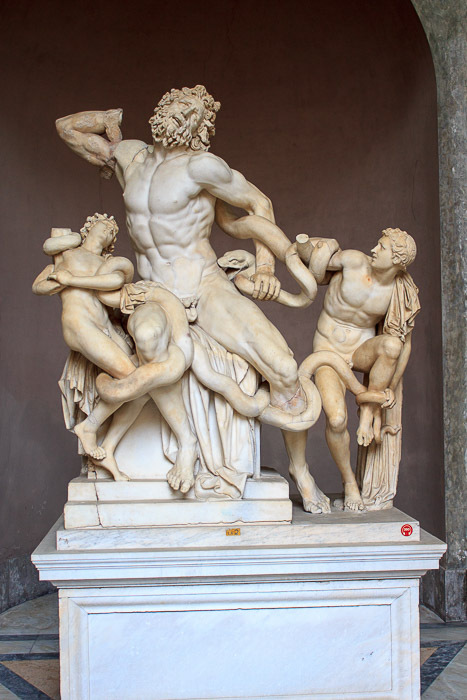 'Laocoon and his Sons', described by Pliny the Elder as a masterpiece of the sculptors of Rhodes, from 40-30 BC, in the Octagonal Court of the Museo Pio Clementino of the Vatican Museum. 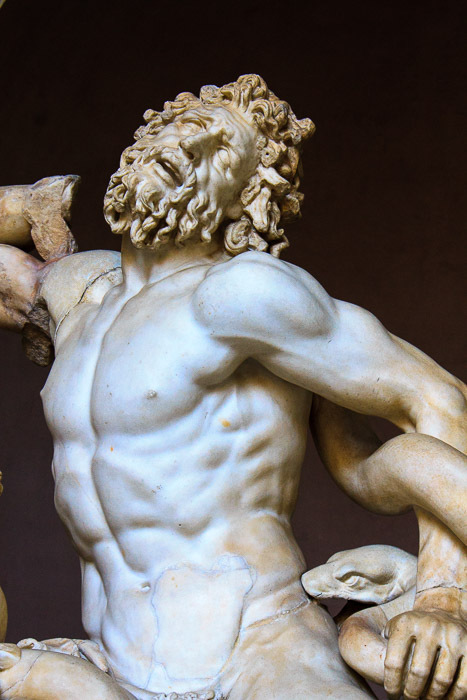 Laocoon was a priest of Apollo in the city of Troy who warned his fellow Trojans against taking in the wooden horse left by the Greeks outside the city gates, Athena and Poseidon, who favored the Greeks, sent two great sea serpents which have wrapped their coils around Laocoon and his two sons and are killing them. 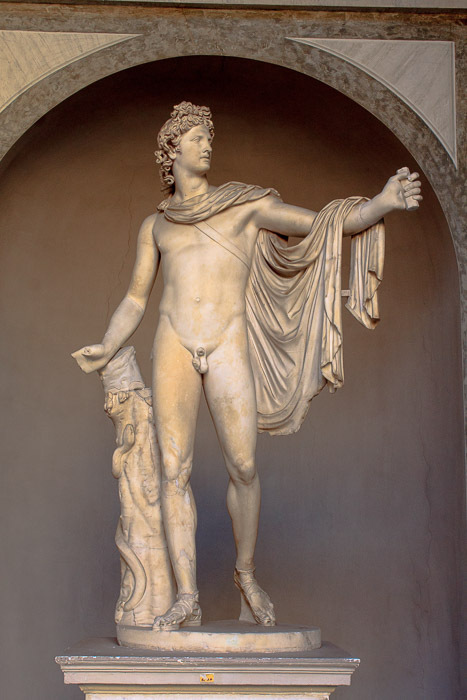 From the Roman point of view, the death of these innocents was crucial to the decision by Aeneas, who heeded Laocoon's warning, to flee troy, and this led to the eventual founding of Rome. 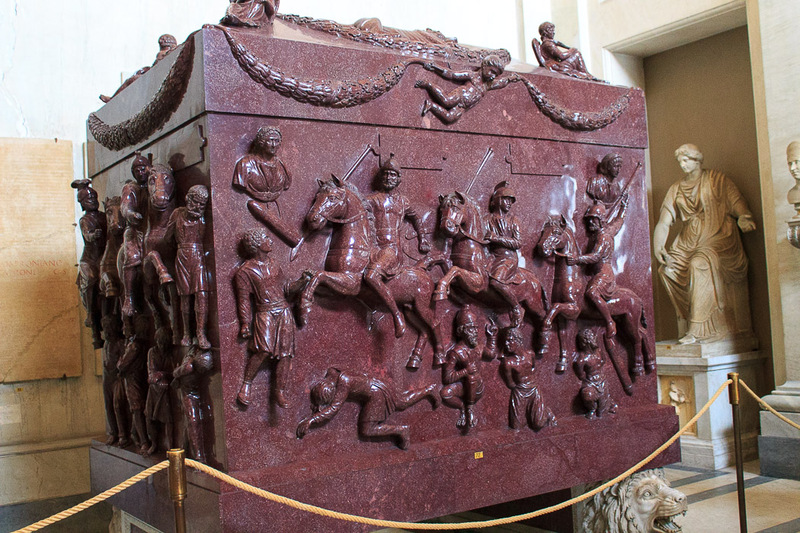 Red Porphyry Sarcophagus of St. Helen, mother of Constantine the Great, who died around 335 AD, carved with military scenes with Roman soldiers on horseback and barbarian prisoners, now in the Greek Cross Hall of the Museo Pio Clementino in the Vatican Museum. 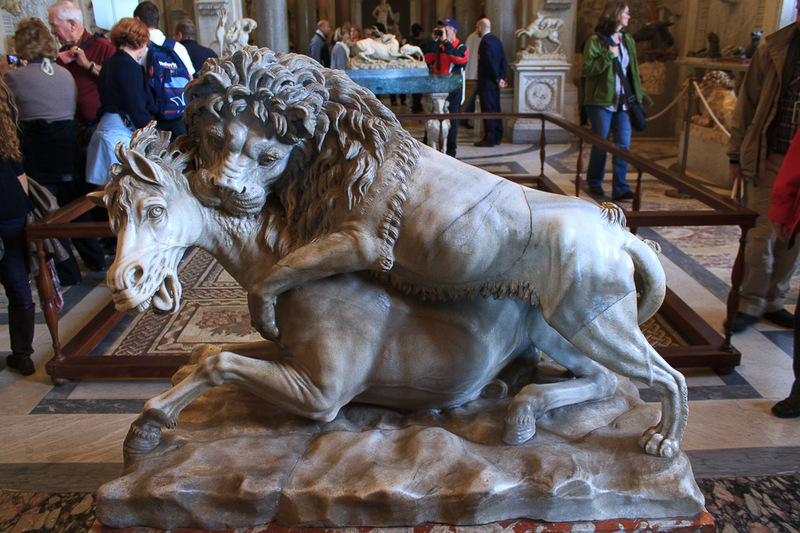 On the lid of the sarcophagus figures of cupids and victories hold garlands, while on the very top there are two lions on either side of the ridge, one sleeping, the other lying down. 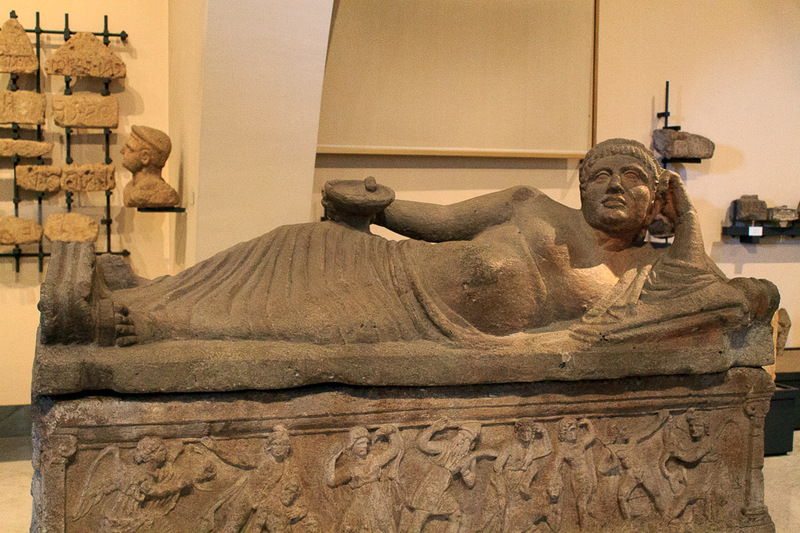 Red Porphyry Sarcophagus of Constantia, daughter of Constantine the Great, who died in 354 AD, and was buried in a mausoleum beside the Basilica of St. Agnes, now in the Greek Cross Hall of the Vatican Museum. 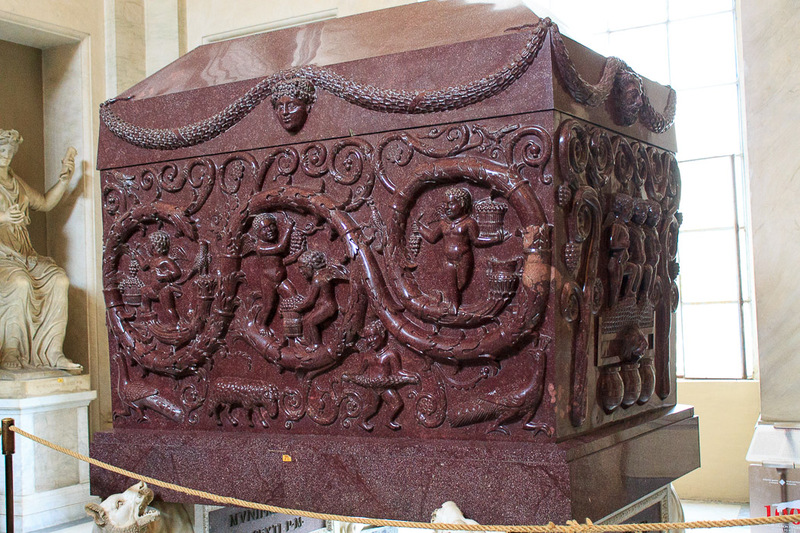 The coffin is decorated on all four sides with garlands and grape vines, large acanthus scrolls and cupids treading grapes. Below there are two peacocks, a ram and a cupid with garland. 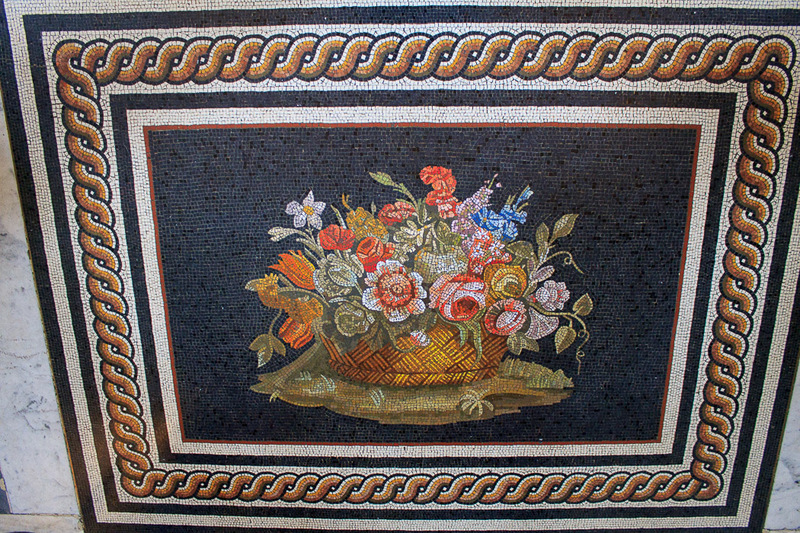 The Dionysian decoration of the grape harvest also appears in the exquisitely refined mosaic decoration of the vault of the mausoleum of Constantia. 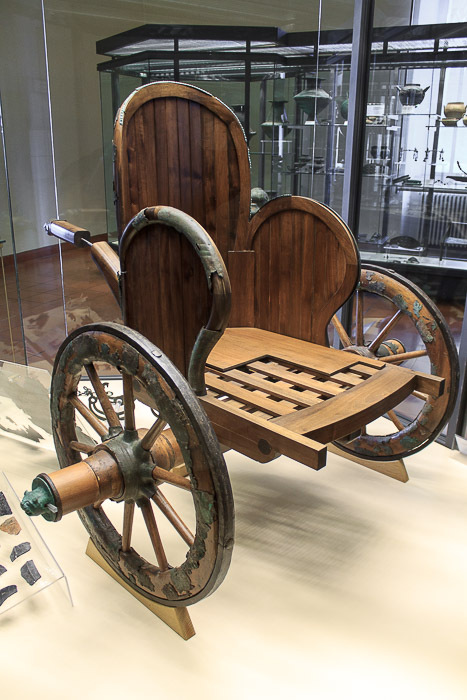 Chariot from 550-540 BC, from the estate of Roma Vecchia, of laminated and melted bronze, on modern wooden reconstruction, in Room I of the Museo Gregoriano Etrusco in the Vatican Museum. 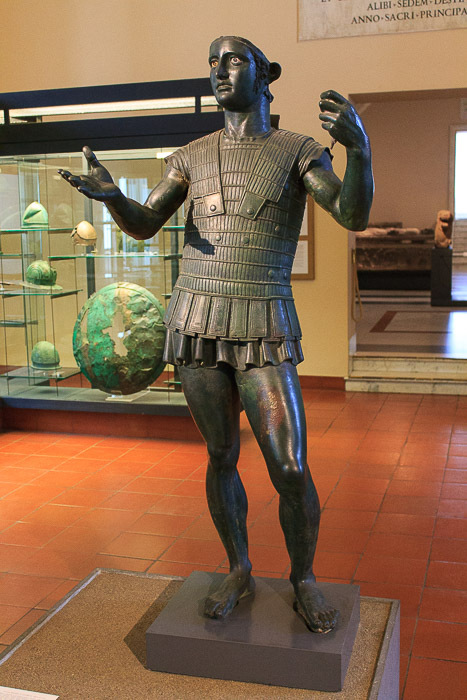 A worthy example of bronze art is given by the metal cap with the eagle's head that covered the extremity of the shaft, finished off with a chisel and a punch. 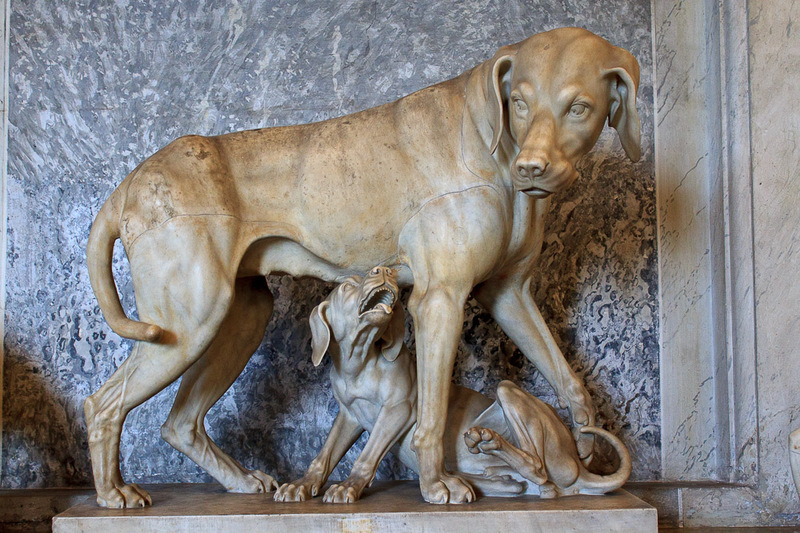 The Raphael Rooms show huge works of art; try to not be numb to them by this point (as I was). 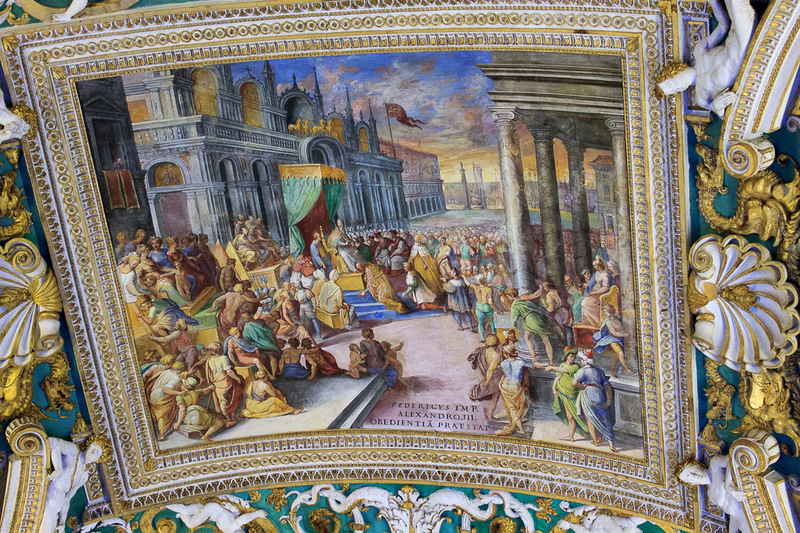 Raphael's Constantine Frescoes, 1517-1524, depict the Battle of the Milvian Bridge, in which Constantine saw a sign from God, used it in battle to defeat Maxentius, then made Christianity the official religion of Rome. 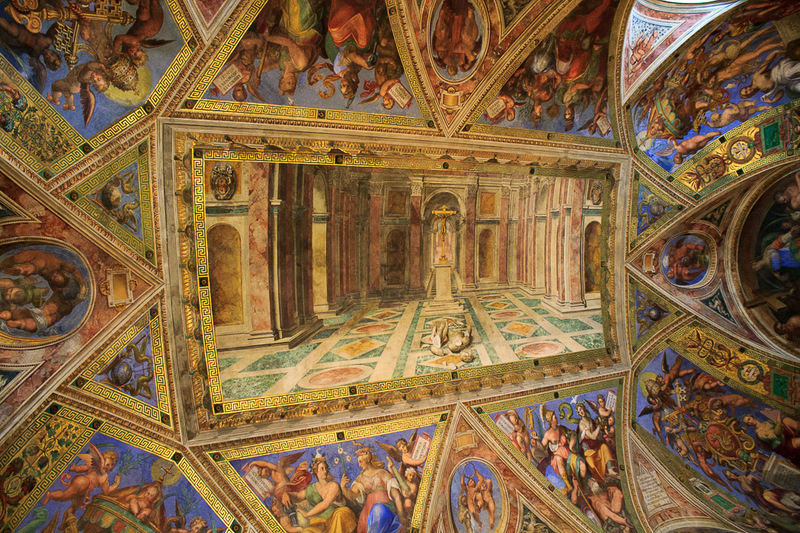 The ceiling shows a pagan statue knocked to the ground and broken, with a Christian cross dominating above it. 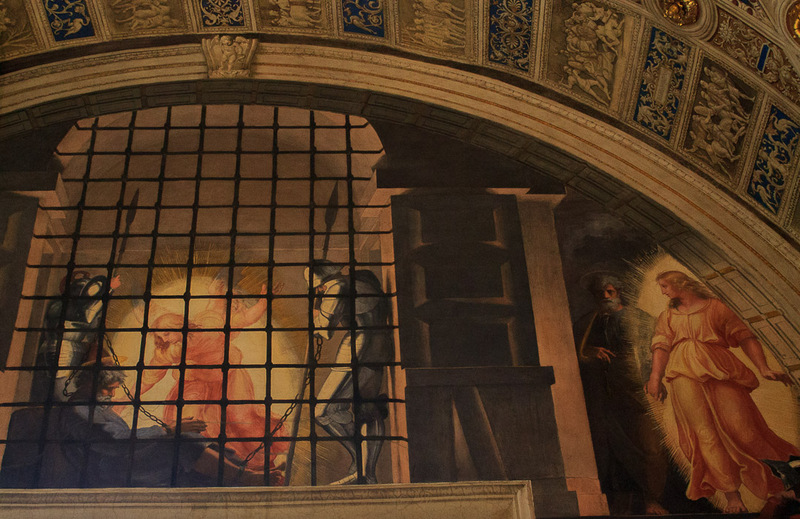 A room further on, the Liberation of St. Peter depicts the moment that angels appeared to the imprisoned St. Peter and rescued him by breaking his chains (those chains are now in the church of St. Peter in Chains). 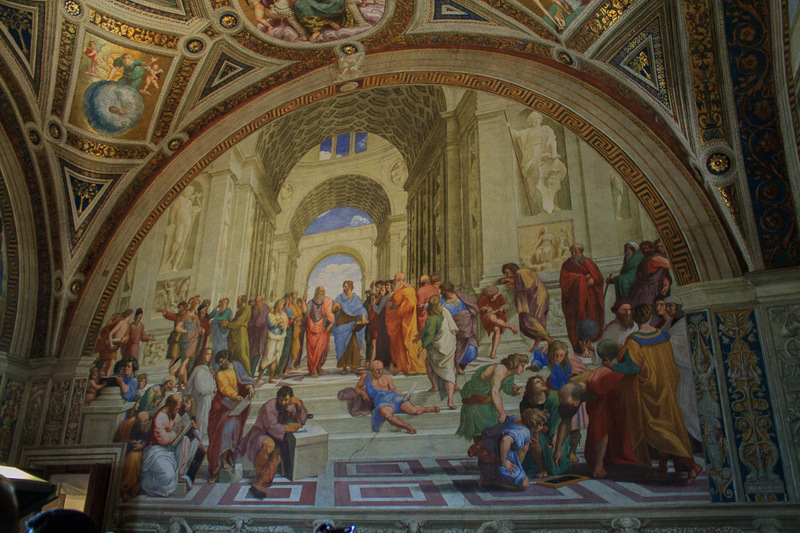 The School of Athens celebrate the rebirth of learning during the Renaissance. 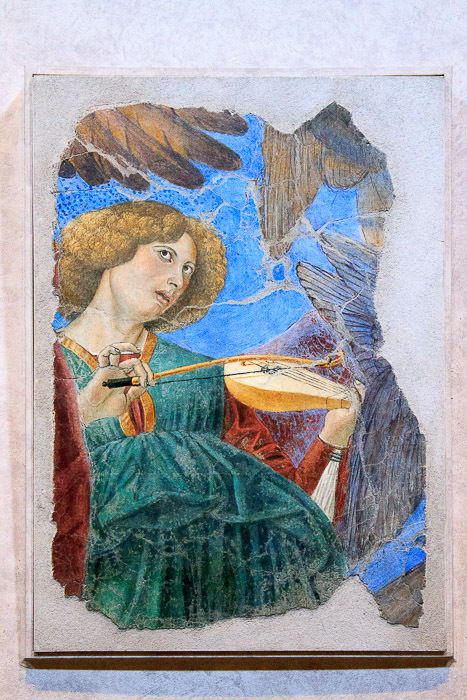 La Disputa depicts religion during the Renaissance. 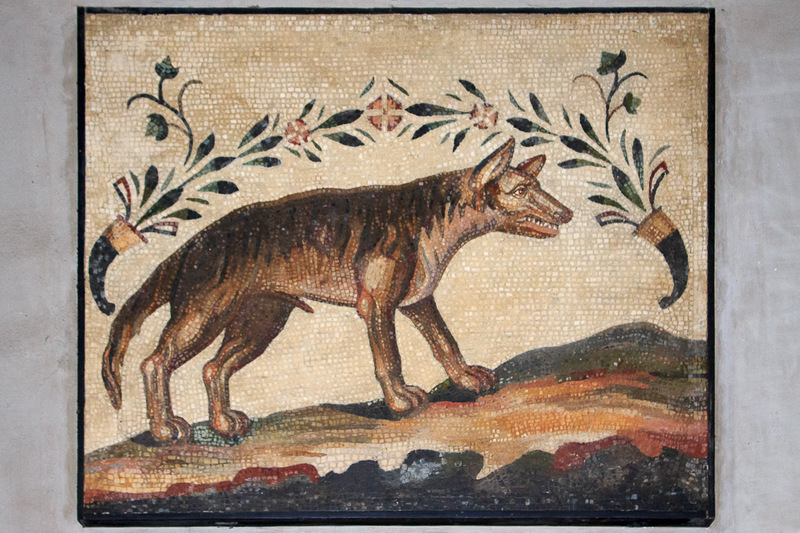 A few rooms of modern art end the section of the museum with Renaissance artwork. 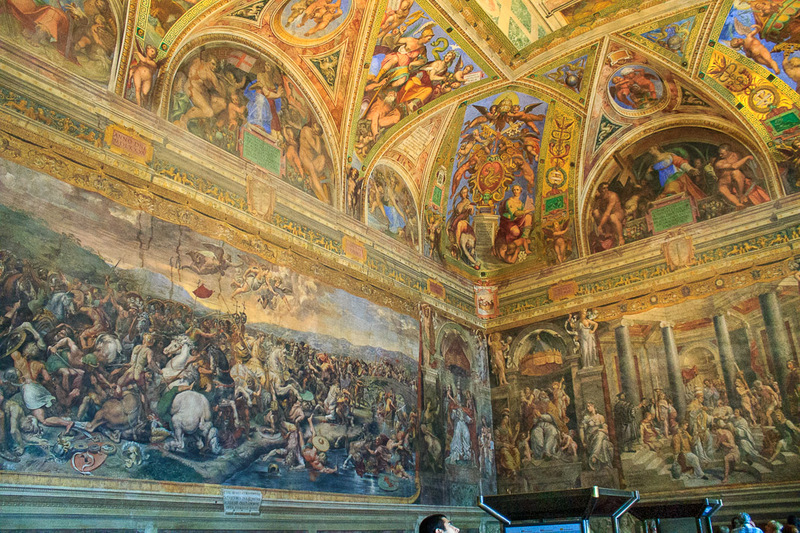 The last stop in the Vatican Museum is the Sistine Chapel, where no photos are permitted. Remember where the door is that you walked in. 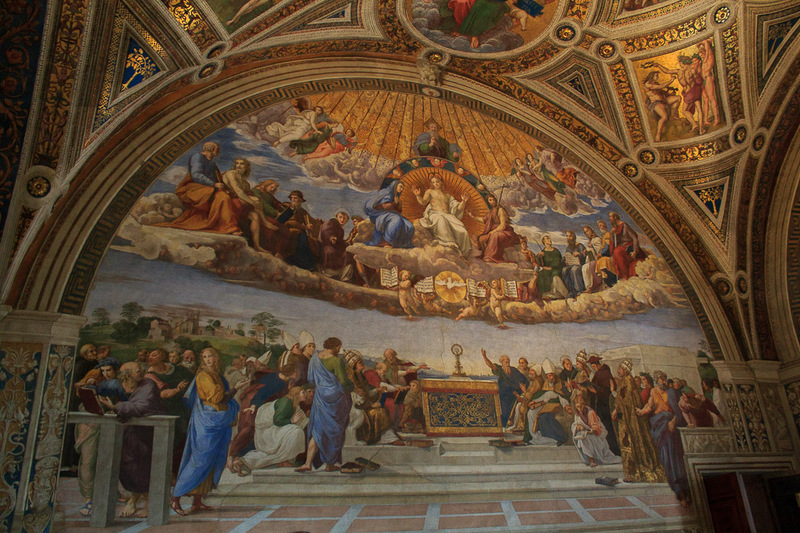 Once you've made it into the chapel, take your time and enjoy the world-renowned artwork of Michelangelo; remember that you'll likely not be returning here ever again, and an extra half-hour here won't matter much to the schedule in the long-run of your life. Then either exit the side of the chapel to walk back to the exit near the museum's entrance to turn in your audio guide or pick up your checked bag, or exit out diagonally from where you entered, blending in with a tour group to enter St. Peter's Basilica, which you're right next to at this point, without the long walk outside. If that door diagonal to where you entered the chapel is closed, just hang out for a few minutes; you'll get your chance. Beside that central spine are alternating squares which show the Prophets (the largest figures on the ceiling) and triangles which show the Ancestors of Christ. 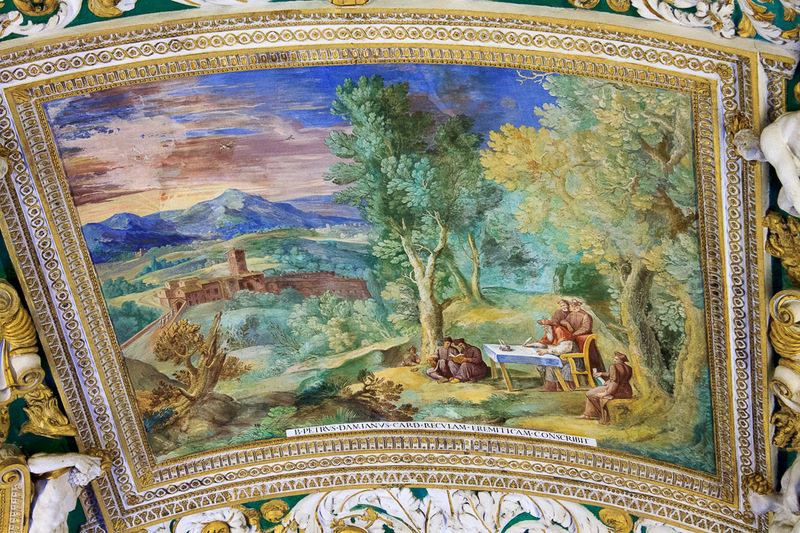 See all Sistine Chapel photos. 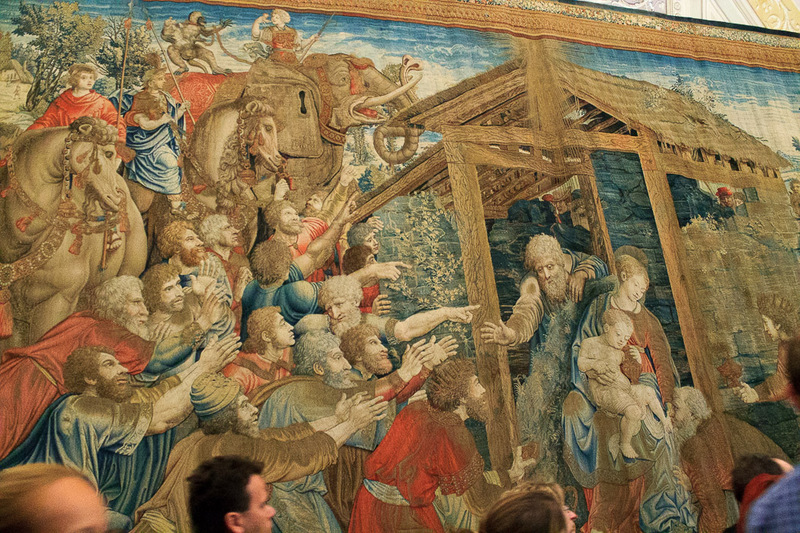 At the end with the altar is the huge painting of The Last Judgment (center of 1st photo below), painted 23 years after the ceiling, which shows how the righteous (on the left) are carried up to heaven and the wicked (on the right) are pushed down for their punishment. If a long study of this grim wall with no one smiling can't make you straighten up and fly right, you might want to give up trying. 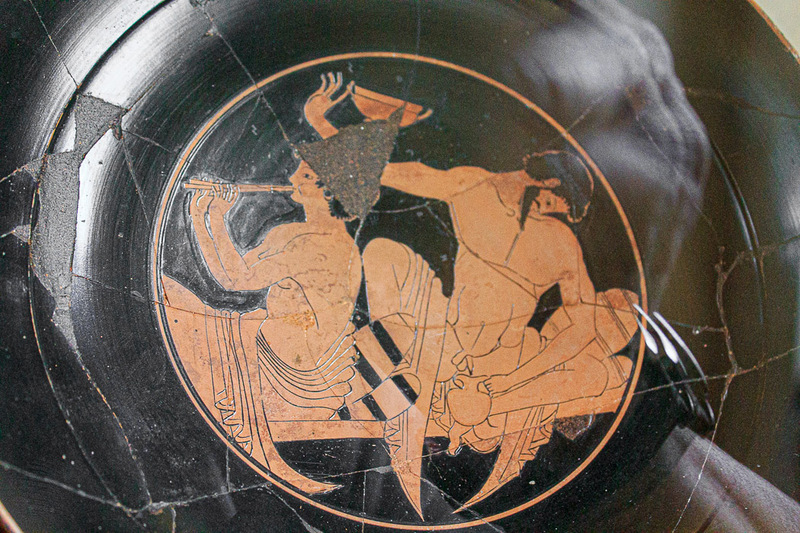 Is that Charon the ferryman at the bottom, just right of center, wacking people with his oar? 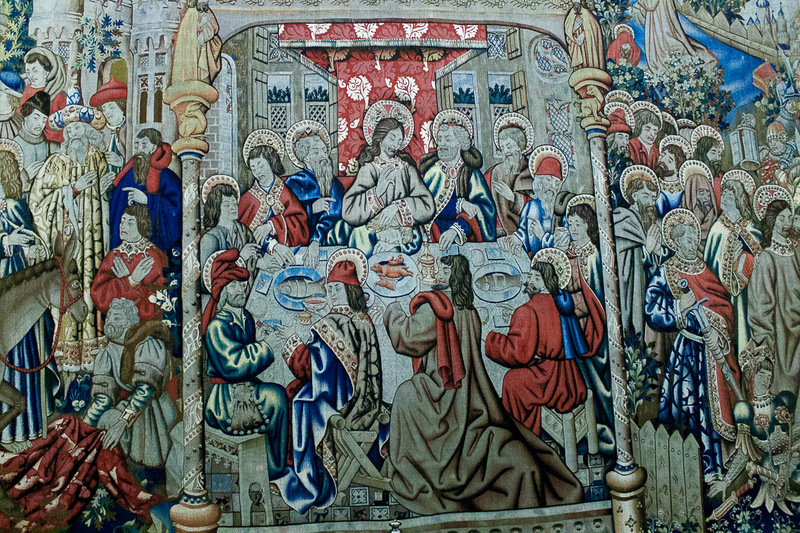 And Jesus, at the center near the top, with Mary under his raised right arm, is he a completion of the Belvedere Torso?